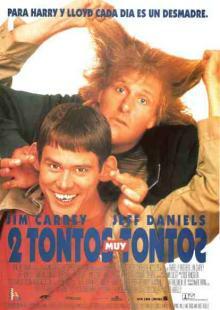 Lloyd y Harry son dos amigos bastantes idiotas cuyas vidas son un auténtico desastre. El primero trabaja como chófer de una limousine, mientras que su amigo se dedica a transportar perros. Un día sus existencias se complican aún más cuando Lloyd se enamora de una chica adinerada que desaparece dejando olvidado un maletín. A partir de ese instante Lloyd embarcará a Harry en un viaje por todo el país para devolver el maletín a su amada. Jim Carrey, Jeff Daniels, Lauren Holly, Mike Starr, Karen Duffy, Charles Rocket, Victoria Rowell, Joe Baker, Hank Brandt, Teri Garr, Brady Bluhm, Cam Neely, Felton Perry, Brad Lockerman, Rob Moran, Kathryn Frick, Zen Gesner, Lawrence Kopp, Clint Allen, Connie Sawyer, Lin Shaye, Mike Watkiss, Harland Williams, Diane Kinerk, Hillary Matthews, Lisa Stothard, Sean Gildea, Charles Chun, Helen Boll, Fred Stoller, Karen Ingram, Jesse Borja, Vene L. Arcoraci, Anna Aberg, Samantha Carpel, Elaine Wood, Bruce Bowns, Denise Vienne, Nancy Farrelly, Catallina Izasa, Samatha Pearson, Ken Duvall, Cecile Krevey, George Bedard, Bill Beauchene, Gary Sivertsen, John Stoneham Jr., Terry Mullany, Brad Blank, Mark Miosky, Mike Cavallo, Tom Leasca, Kevin Sheehan, Kenny Griswald, Brian Mone, Brad Norton, John Dale, Mike Burke, Kevin Constantine, Chris Spain, Paul Pelletier, Mark Levine, Bill Smith, Mark Charpentier, James Ahern, Jim Blake, Traci Adell, Anita Rice, Pam Nielson, Nancy Barker, Brad Louder, Doug Caputo, James Horrocks, Rolfe Brekke, Clem Franek. Peter Farrelly (Dirección), Mark Irwin (Montaje), Bennett Yellin, Peter Farrelly, Bobby Farrelly (Guión), Todd Rundgren (Música).